This section of the tutorial shows you how to set up a transient simulation for a synchronous buck converter. 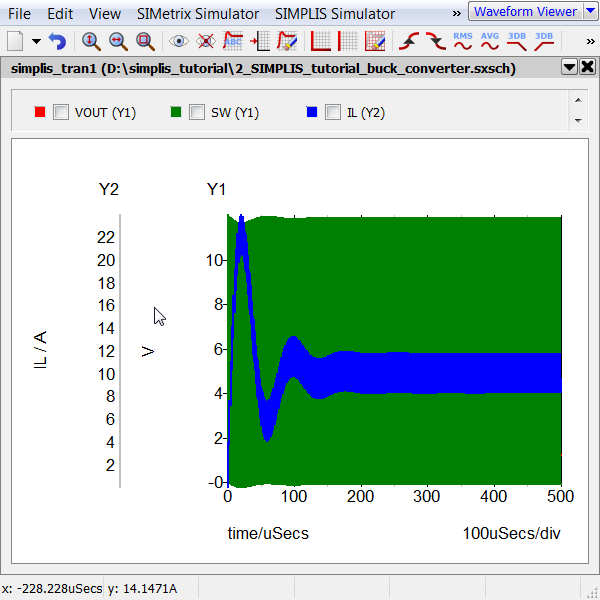 The SIMPLIS transient analysis is similar to the transient analysis available in other simulators, but it runs much faster. 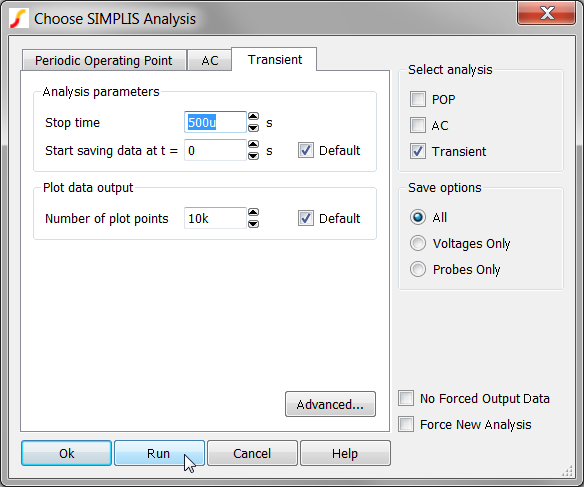 Although the analysis settings are almost identical to SPICE transient analysis settings, the math used in each simulator is vastly different. This allows SIMPLIS to simulate circuits much faster than SPICE. How to set up the buck converter to run a basic transient analysis. How to enlarge a graph and zoom in and out to examine it more closely. From the menu bar in the Schematic editor, select Simulator > Choose Analysis... .
Click the Transient tab, and change three settings that to run a transient simulation from 0 to 500μs and to save all node voltages on the top level of the schematic. In the Select analysis section on the upper-right side of the dialog box, click the check box in front of Transient. In the Analysis parameters section, set the Stop time to 500u. In the Save options section, click the radio button in front of All. At the bottom of the dialog, click Run. Note: If you have already selected Ok or pressed Enter, press the keyboard shortcut F9. Result: The simulation executes and the waveform viewer window opens with curves for the three probes. To zoom in, press and hold the left mouse button and drag a rectangle around the graph area. To zoom out, press the Home key. To return to the previous zoom factor, type Ctrl+Z. A schematic saved at this state can be downloaded here: 3_SIMPLIS_tutorial_buck_converter.sxsch.